Maria has been the Chief Client Experience & Digital Officer at Sun Life in Hong Kong since 2016 where she is shaping and delivering the digital transformation agenda of the organization that firmly anchors on putting clients in the centre. Maria has over 22 years of corporate and consulting experience in digital transformation and marketing management. She is passionate about creating human-centred digital services and culture for businesses where client experience is a strategic core priority. Maria spent 10 years at HeathWallace, a leading international digital design firm, where she founded in 2006 their user experience design business for Asia Pacific. She worked with a number of financial services firms across Asia and Australia to help them deliver on their brand promise and pursue sustainable growth through market-leading digital engagement platforms. Prior to joining HeathWallace, Maria spent six years at AXA Investment Managers in London, Paris and Hong Kong where she was responsible for developing the asset manager's global online strategy and marketing capabilities as their Head of Change Management for Global Marketing & eBusiness. 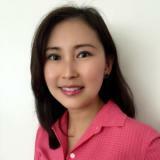 Maria began her career developing client acquisition and retention programs for global consumer banks in Hong Kong. · What does it mean for your organisation and your customers to be truly digital? Check out the incredible speaker line-up to see who will be joining Maria .